Architen Landrell has worked in the industrial fabric industry for over thirty years and draws on this experience to offer a wide range of industrial services. Adopting the same principles of project management, quality and customer service which we offer our architectural clients, Architen Landrell can provide anything from small repairs to large contract cutting and welding projects. Our comprehensive knowledge of fabrics and their varied properties allow us to meet and surpass our clients expectations. The following guide will give you an overview of the production services which Architen Landrell offers. Please contact us for additional information including specialist technical detail and pricing. Using state-of-the-art equipment Architen Landrell provides a cutting service unrivalled in the UK. 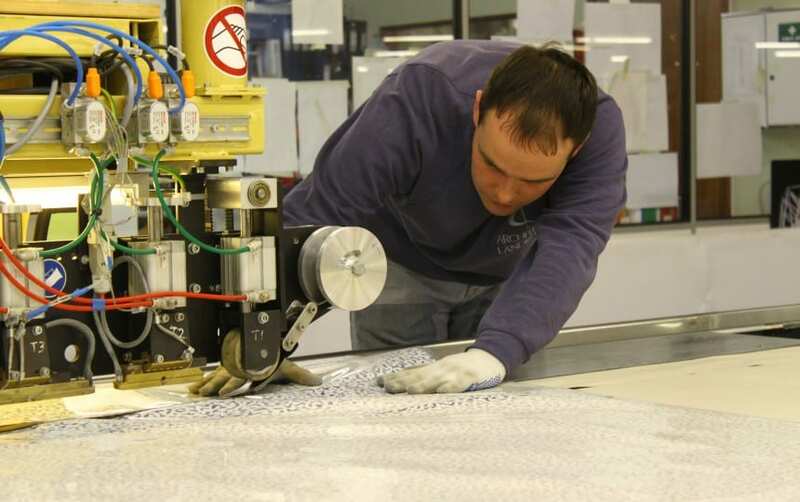 Our CNC cutter is capable of cutting fabric up to 3.2 metres wide and unlimited lengths. Shape is no problem either; with advanced CAD technology we can cut even the most complex patterns and adjust layouts to minimise fabric wastage. Interchangeable blades mean that as well as bespoke patterns, we can cut regular circular shapes as small as 10mm in diameter. Our equipment cuts any material in record speed so fast track work is no trouble at all. Architen Landrell draws on decades of welding experience to provide high quality workmanship. Our factory houses five high frequency welding machines and a wide range of welding electrodes allowing us to produce welds from 20mm up to 80mm wide. We use a combination of fully automatic welding machines which are ideal for welding straight lines, while our smaller, more compact machines allow us to weld more intricate shapes. For maximum flexibility, we also use portable welding machines that can not only be moved freely around our factory but have welding heads that can rotate around 360 degrees! Our years of experience have taught us to work with even the most complex fabrics such as PTFE and Silicon glass cloth. For these teflon fabrics we use our three specially designed thermal conducting welders that allow us to maintain a high and precise level of temperature control. In order to provide a first class sewing services to all our clients we have a dedicated sewing room equipped with a wide range of industrial sewing machines capable of sewing even the toughest materials; from leather and webbing to lycra and lightweight meshes. Whether its a repair you need or fabrication from scratch, our experienced team of fabricators will provide a professional and quick turnaround service. Using the buying power that comes with purchasing thousands of linear metres of keder and extrusion every year, we can offer fantastic prices to our clients on a wide range products. We know that with constant use, particularly for demountable structures, that small repairs and adjustments are required. Our welding and sewing teams can usually provide a solution, whether a re-weld or a large patch there is no job too small. With a wide range of architectural fabrics in stock, we can supply fabrics for most applications. Colour and quantities will be dependent on stock levels so please get in touch to discuss. As Director, Christopher oversees the day-to-day operations of the company.